Even from young kid days, Fred Patacchia always had his own way about things, anything and everything. Freddy was never afraid to speak his mind and never in short supply of a friendly smile. With a talent for surfing that was noticed early on, the North Shore local qualified for the World Championship Tour in 2005, where he started an elite career off in fine form by winning the coveted Rookie Of The Year award. Freddy P went on to compete on tour for the next decade but only with moderate success, besting his stellar rookie season with 12th place end rating in 2008. Growing up as a professional surfer is a career track tendered to the few, and those few usually don’t last that long. And more often then not, professional surfers don’t leave the world tour on their own accord. The phrase “falling off the tour” gets used a lot and never with a positive under tone. It seems that once you’re disqualified from the limelight of surfing’s highest stage, it’s a rare feat to ever return back to it. Fred Patacchia broke the mold this year with his historic exit from the WSL world tour at the recent Hurley Pro at Trestles, CA. After looking to be in the best form of his career, Freddy went out and retired from the WSL tour with a bang. The 33-year-old shocked the crowd and the world. First, Fred threw down one of the greatest displays of backhand surfing at Trestles ever witnessed, garnering a perfect score 10 point ride. Knowing it was his last wave on tour and being the genuinely nice guy he is, Freddy P graciously tried to triangle one of his competitors so they could advance to the 3rd round instead … but to no avail. In his “drop the mic” moment, Fred broke the news during his post-winning interview. As soon as he came home to Hawai‘i, we had to catch up with the newly retired Freddy and get the scoops. Switching gears to what’s recently happened… you’re retiring, or not retiring, or on a hiatus… what are you calling it? But you are retiring from the tour? Tell us that ten-point ride. Were you waiting for something big like this to announce your retirement? Well it really was something that I was dealing with during Snapper, even before Snapper, which is the first event of the year in February. And it was kind of just eating away at me – whether I wanted to keep doing what it was I was doing. It’s stressful, and I’m one of those guys that go off feelings. And I want to be happy. I want my family to be happy, and in order for them to be happy I have to be happy. So I fell out of love for competitive surfing. I wasn’t free surfing as much; I wasn’t going to the gym as much because I thought why? Why am I putting myself through this? Do I really have to? Do I really have to prolong my career another two or three years before maybe I’m pushed out by the younger generation? Like when do I make this choice? In Tahiti is where I really made the choice. I told the guys at WSL, ‘guys I only want to surf my first heat at Lowers, I’m hoping you guys can replace me.’ At the time they said they could and that was really it. I put my foot in the ground and I just told myself that that was going to be my last heat on the WCT tour. It took me a while to get there. I have no shame in saying that I have my chi aligned. I was trying all these different things, and the chi thing actually really worked, it helped. I talked to sports therapists, I spoke with Ross Williams a lot, other ex professional surfers that have gone through the same sort of thing that I’m going through, because mentally and emotionally it’s a lot. People don’t realize that and it was weird for me to have to ask for help. Like, do I really need to talk to a psychologist or a sports therapist? Do I need that? I’m a strong human being, do I need that? And I did. It really helped me close that book and say ‘yes, that is that day, that is the heat that I’m going to call it on.’ And to get that wave, that just happened organically. That night I couldn’t really sleep, there were a hundred ways I thought it was going to end in my head. Getting a 10 and an 8.90, I think it was the highest heat total of the event, it was the only perfect ten of the event. I mean, I didn’t think it would ever end that way for me. Especially knowing that that was my last heat. It wasn’t spontaneous at all, it was the universe giving me a high five and saying ‘hey Freddy you’re out see you later, have fun on this wave.’ And I did. So you had a retirement plan all along? We did have a plan to a certain extent; everyone that I had told was still on the fence of whether I was going to actually follow through with the plan. I knew in my mind I was, even my wife was telling me, “You can always change your mind, five seconds to go you can always change your mind and it can be like this thought never happened.” But in my head I knew it was going to happen. And I think the second my wife and daughter were on the beach and they had the flag and the leis… It felt very Hawaiian, it felt very local and it just melted me. I wasn’t expecting that because we kept it from a lot of people. And Kelly Slater was down there and Owen Wright, and some of the Hawai‘i guys that were still on tour and we didn’t tell any of them, they just so happened to be there at that time, and they all came out and greeted me and it was so surreal and so magical. I don’t know what it is, I might have done something really good in another life or maybe I’ve done pretty right in this life to deserve that. How did you feel when you hit the beach, was it a feeling of relief? I came in with like four minutes left. I had shaken hands with Medina and Bede Durbidge, they were out there with me and the second they congratulated me, and they both had very nice things to say about me as a person and about my career. And to hear that from them felt really good. And then knowing that I was going into another chapter in my life, it was scary but it felt so great. It was the biggest weight off my shoulders. I knew that I no longer had to… I don’t know, produce in that sort of capacity as a competitor. I always want to be a role model, but you almost get to shed that as well. It’s a lot of pressure being a role model for young kids as well. It was one of the most alleviating feelings I’ve ever had in my entire life. It felt fantastic hahaha. You said you want to spend more time with your family. Tell us what that means and what that looks like for you in the coming years? Another reason why I ended it at Lowers is because I know I’m going to have to do something after surfing. No one just sits around and does nothing. So I intend to not put a jersey on for the rest of 2015, re gather my thoughts and possibly do a few events come 2016. I’m not going to compete in the Triple Crown. No Pipeline, no Haleiwa, no nothing. I intend to go to the events to cheer on my friends that are in the event, bring my daughter, my wife, and son down there and just enjoy those events. Not have to get up a 6am and surf Sunset, Haleiwa, and Pipeline first thing in the morning. I get to sleep in, I get to wait for the call, I get to do things that normal people do. I get to look for parking haha. I get the full spectator experience and I look forward to that. I’m a fan and I am going to do those things. Just being home with my family and doing the kind of everyday normal dude life is what I want to do for a little bit. Eventually I’m going to have to get a big boy job and I don’t mind it. I’ve been talking to Quiksilver about that already and they are finding a position for me. But I’d also like to work with different foundations. I’m working with the Young and Brave. They help support young kids that have leukemia; they help support their families. I want to be able to be part of those kinds of things. I also want to do things like the great Aloha Run because they donate to some fantastic things. The Fourth of July race here on the North Shore because it supports our local lifeguards and junior lifeguards. I look forward to doing those kinds of things within our community where I can help. I want to do things that don’t necessarily make me money, but make me happy. In 2016 are there specific QS events you want to focus on? Yes. 2016 I am hoping to surf the Lowers Pro, the Triple Crown, and a few select events. I haven’t looked at the schedule yet, but I want to go to places that I want to compete at. Waves that I’ve maybe never surfed before. 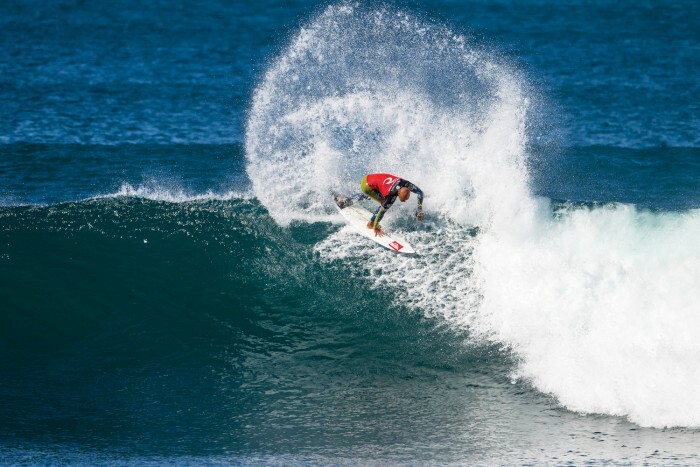 Waves that I think hold merit and are waves that should be highlighted on the QS tour because it gets such a bad name, but there are some really good waves. They may not be the waves that you get the most points or have the biggest star to them, but they are world-class waves. I also just want to travel and surf. I want to get barreled again, I want to go and chase a swell. I haven’t done that in so long. The tour just keeps me so busy and every time that there is a break within the tour I’m doing things with my family. 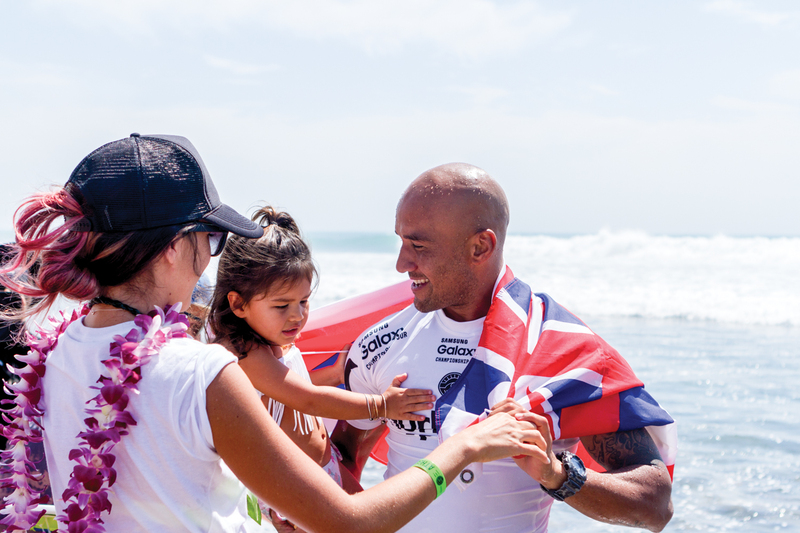 I want to chase some swell with my family now, go to Tahiti for a week, and bring them with me. I don’t want to completely stop being a pro surfer. I want to be a different kind of pro surfer, a different kind of person. Who’s going to win the world title this year? Mick Fanning is going to win the world title this year. No if, ands, or buts about it. I really think he’s looking in form. He always kills it in France and Portugal and even here in Hawai‘i he really excels. I really think it’s going to be really tough to beat him. Hands down Mick Fanning. he mixes up his maneuvers beautifully. I’ve really been in awe of the way he has been surfing lately. I think that people’s favorite surfers should change a lot because people are changing frequently and surfing is changing. So as of right now Owen is my fav. He’s still in world title contention, I think he can do it, but I think Mick is just freight training. Mick has the mojo right now. Favorite moments on tour this year? First of all would be the day I stepped away. That perfect ten was amazing and just having everyone there for me and all the support, texts and emails I’ve gotten could go down as top five days in my life. But then I loved Snapper Rocks; Freddy’s rock was a lot of fun. It was something that I’ll look back on and laugh and cheers over beers with. Getting to celebrate my sons first birthday in Tahiti was awesome. I brought the whole family there so we were all together, we had a nice little party for him where we made haku leis and a couple of my surf buddies came and we celebrated together. That was really special because he is not going to get to know his dad as a professional surfer. For him to experience that with me when he turned one was nice. Turing one is a big thing in Hawai’i so we did it in Tahiti and it was special.